1. buy the biggest and BEST dinghy (most likely to stay to stay afloat) you can possibly afford. More high winds today….up to 55 miles per hour. Our instruments are already registering 40 knots. We noticed a Coast Guard boat racing by Cat Maudy. This is pretty unusual – since this is a no-wake zone and they usually travel very slowly near the marina. Not today. They were on a rescue mission. A person on a dinghy from a nearby anchored boat was trying to get to the City Marina dock. Less than 100 yards. They didn’t make it. 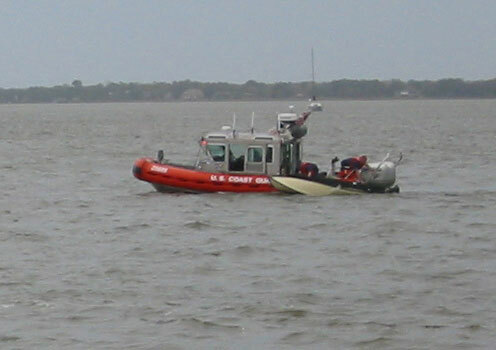 The dinghy capsized in the high winds – and the person had to be rescued by the Coast Guard. Below are some pictures of the Coast Guard recovering the failed “cheap-O” dinghy. Time for an upgrade!